This large set of living room windows show off a lovely view of the valley below. But they needed something to soften the edges and finish the room. A set of richly embroidered linen drapery panels were placed on the outside edge of each window to frame the view. The panels were pleated to pattern using a simple cathedral pleat. 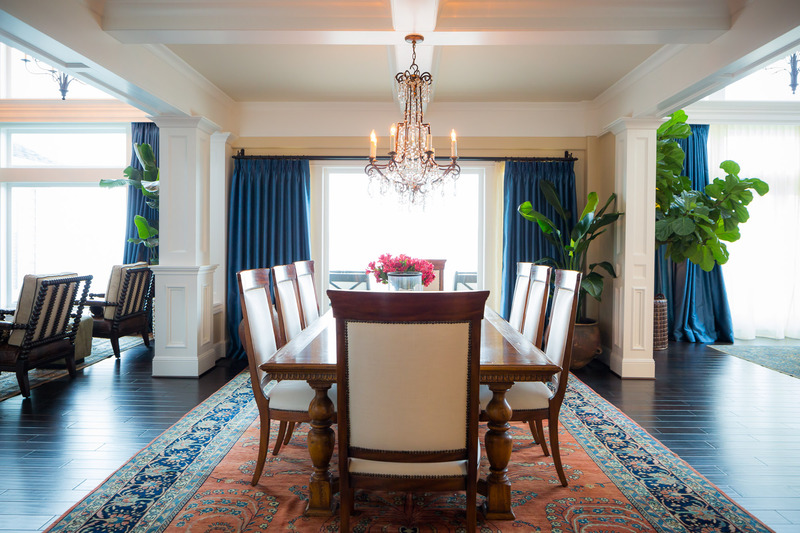 This formal dining room was finished with a set of silk draperies that fully function. The golden wood rods echo the living room in a smaller scale. The master bedroom was finished with a set of embroidered silk ruffled side panels. We finished a media room with 24 feet of blackout lined motorized drapery in the family room. …but a professional photographer is priceless. How can you enjoy your deck on a drizzly day? With custom curtains of course. This lovely back yard with a covered patio was well used as a place to relax and enjoy the company of friends and family. But here in the Pacific Northwest it is often difficult to enjoy the mild temperatures of spring and fall with a misty rain or breeze blowing across the yard. 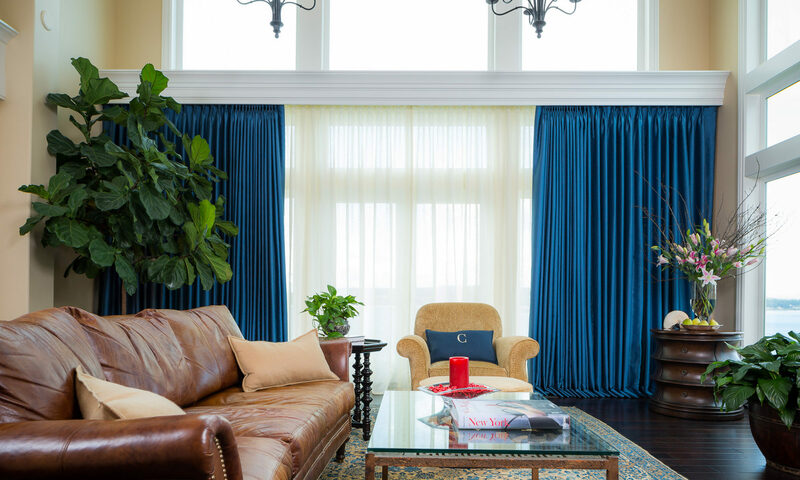 These curtain panels are made from indoor/outdoor fabric to stand up to the rain and sunshine. We also added a contrast band of fabric at the bottom to keep any signs of dirt to a minimum. When closed the panels create a warm cozy room that still has a view of the yard. The homeowner put up pipe for rods and found IKEA kitchen S hooks work well to hang the panels. Small grommets at the top make it easy to hang the curtains and to take them down if the weather gets too wild. Here is a view from outside the patio. There is a 1/2″ chain in the hem to keep the panels from blowing too much. 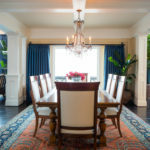 This room is now ready for entertaining, enjoying a cozy fire or relaxing with a good book and a glass of wine. The Nanny, a birthday and a doll. My daughter had an idea for a special birthday gift. She has a darling girl in her care several days a week as she works with and for a young family in Georgia. As the first birthday approached for this little one, Rachael wanted to give a gift that would be fun, meaningful and maybe last for years to come. Her idea was to give the book series of “The Lion, the Witch and the Wardrobe”. This series was and is a favorite set of stories for all of my children. We have read them aloud as a family and everyone has also enjoyed reading them alone. Age 1 is a little young for these complicated adventures, but it is certainly a series to grow into. The second part of her idea and gift was for me to make a doll of one of the characters from the stories. We talked it over and settled on ‘Lucy’. I worked on this doll over the course of several weeks sewing a bit in the evenings. I haven’t made a doll from scratch in several years, I felt very out of practice. But this was a fun project. I appreciated the inspiration and lessons from Pinterest. When ‘Lucy’ was finished, she was packed up and shipped to Georgia arriving just in time for the big day. This little one seemed very happy with her gifts. I hope she enjoys her stories for years to come.